Having owned this particular Big K for about six weeks now and ridden it near daily, rain and shine, I'd promised myself I would swap the tyres for something a bit more sticky, modern and less touring oriented. The bike came with Metzeler ME880 Marathons on it, the back tyre one size too small, width-wise. Apparently, the P.O. wanted tyre life to be the prime directive as these things wear like iron but most definitely do not stick like glue! The profile of the new sports-touring, dual compound tyre is sharper for easier turn in compared to the relatively lazy profile of what is, essentially, a heavy touring tyre in the old skin. 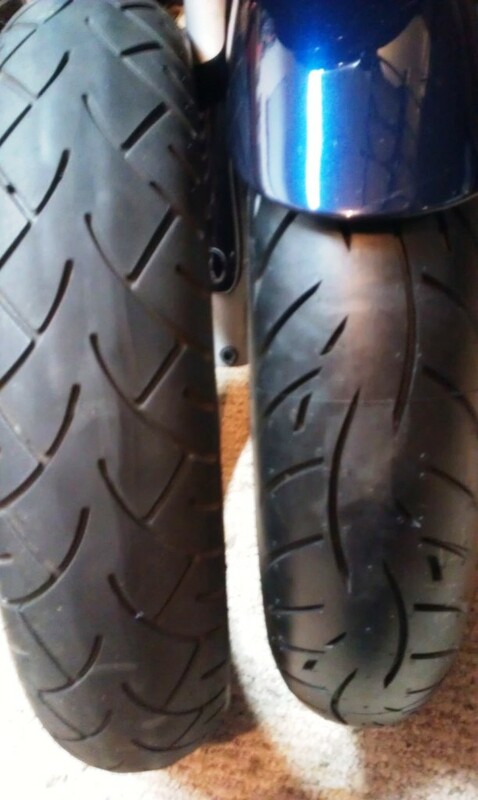 The front tyre was beginning to get a half an inch wide flat spot across the centre but had miles to go before it would reach the wear bars. In bends it was a bit of a wrestle to get her to turn. The ME880s are intended for bikes like the 800+ pound K1200LT, large metric cruisers and 'Wings; it's rated for heavyweights. Today I strapped a new Z8 Roadtec across the back of the seat and rode home from my busy week. Once here I got out the tools, threw the garage doors wide open, cold beer frothing over, music playing, and slanting, end-of-the-day sunshine filtering in through the windows. The old tyre came off with a bit of an effort, the sidewalls are that stiff. 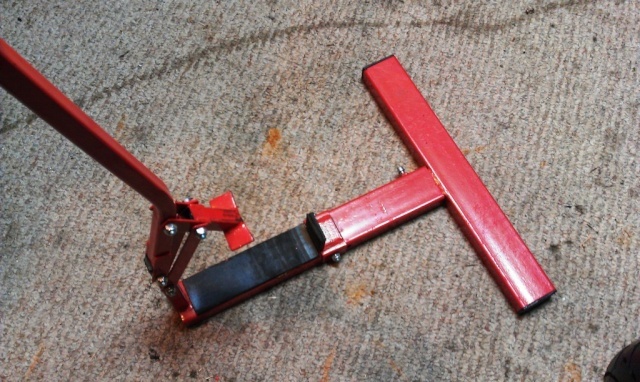 I've a lever action bead breaker, with a half metre-long arm to ease egress, that sits flat against the cement floor. 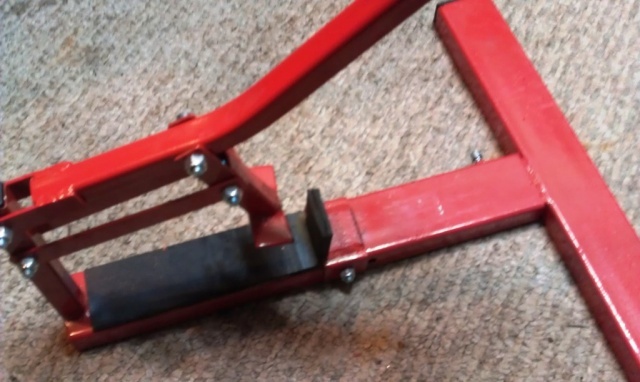 You just slide the inside edge of the wheel rim up against the rubber-coated bracket and press the lever's pad down against the sidewall until she pops inward, free of the rim. Rotate and repeat. Flip the wheel over and do it again until the tyre's bead no longer sticks to the rim all the way round. Here, in the lowered position. A variety of tyre levers of long and longer length are required to prise the tyre off the rim - and to place the new tyre on! 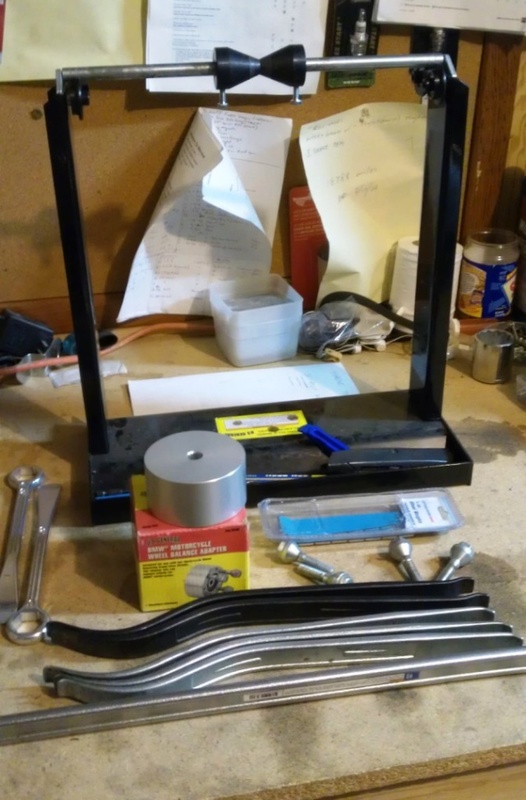 A static balancer sits level on the workbench, it uses adaptors and wheel studs for BMW rear wheels, and tapered collars for pressing in against the inner races of the wheel bearings for front wheels. The shaft the wheel assembly sits on has ball bearing double rollers at either end and once the get the shaft snug against the wheel's bearings and the whole thing is levelled, you just spin the wheel (with new tyre on it) slowly until it doesn't settle at any point consistently after several gentle spins. You then wipe down the opposite side of the wheel with alcohol, dry it off well then press a stick-on wheel weight against the rim. I use rectangular 7 gram (1/4 oz) stick-on weights. The front tyre took just one 7 gram weight after six or seven spins proved it to be settling into a different spot in its rotation each time. A dynamic or spin balancer is purported to be more accurate but I'll be buggered if I feel any tingles of imbalance coming from my wheels at highway speeds, in the many tyres I've fit this way. After a quick wipe down of the manufacturer's new tyre slime in the rubber, I dressed up and went for a gentle, several mile spin round the neighbourhood in the dark. I always take it easy on new sneakers since they're often quite slick in the first fifty to a hunnerd miles, or kilometres. Some call it 'mould release' but I was talking to a tyre manufacturer's rep, long ago, who told me that's a myth as mould release compound is on the inside of a tyre! It's just petro-rubber-off gassing oils that creep to the surface as the tyre carcass heats and cools. Currently, the only tyre brand that doesn't have this slippery 'issue' is Continental in the Road Attack 2, Classic Attack, Sport Attack and Trail Attack models. The front end's new 120/70ZR17-M spec radial felt lighter and potentially more nimble and I look forward to a good burn in the daylight up some mountain passes this Sunday and Monday weekend. 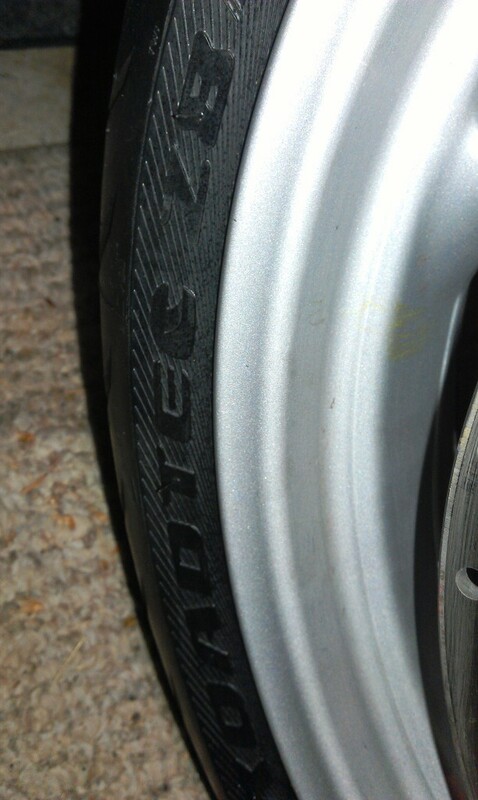 Once I feel that the tyre is feeling groovy I'll strip off the 170/60ZR17 ME880 that's on there now and whack on the equivalent Z8 Roadtec back skin in the proper 180/55ZR17-M size, and then let 'er rip. TWB wrote: ". . . I always take it easy on new sneakers since they're often quite slick in the first fifty to a hunnerd miles, or kilometres. Some call it 'mould release' . . ."
Needless to say, I took it easy for another tank of gas, and now they're working fine. TWB wrote: ". . . The front end's new 120/70ZR17-M spec radial felt lighter and potentially more nimble . . . "
You have the 1100 front end (to my recollection) and 2-piece fender. Are the 120s a tight fit? I have the classic fender and have been wondering about the possibility of upgrading to 120s, but the tolerances now are pretty close. This is on my 1200 Brick. Don't try squeezing a '120' tyre onto a Y spoke wheel. Two reasons: it's far too wide and you'll wreck the profile, losing your steering feel, and, 17" tyres don't fit 18" wheels anyway!